Triphala is an herbal concoction that’s been used for thousands of years in Ayurveda. Traditionally used as a bowel tonic, it’s often prescribed as a mild laxative. But while its laxative qualities are most widely known, the other benefits of this herb are perhaps even more noteworthy. To understand Triphala’s impact, you can look at its contents and their effects on doshic balance. The name Triphala means “the three fruits” and it’s comprised of the Indian fruits amalaki, haritaki, and bibhitaki. Haritaki (terminalia chebula) is known as the Tibetan "king of medicine." Many depictions of the healing Buddha show him extending a handful of this fruit indicating its longstanding medicinal usage in Asia. It’s believed to have a variety of positive health effects on the heart and brain. It can be used as a laxative by itself, but also has an anti-diarrheal treatment. It’s an anti-inflammatory and is calming to Vata. As you can see, each component of Triphala is beneficial to a specific, corresponding piece of the tri-dosha experience that is you. The biggest impact is perhaps the health benefits as they relate to digestion. This mixture encourages balanced, full elimination, by pulling stagnated Ama or toxic residue from the digestive tract and increasing the colon’s absorption functions. Triphala can also be used for dosha balancing. This is due to its relationship with your ability to taste, and your Rasa Dhatu, or plasma. In Ayurveda, the sense of taste is considered divine by nature. The information conveyed by your tongue is multilayered and more complex than just the literal taste of the food itself. In Sanskrit the word for taste is Rasa. This is also the word for plasma as well as emotions or mood. Like so many other Sanskrit terms, this connection of using the same word for taste, plasma, and emotions carries a deeper meaning. Since your plasma cells are the first of the body to be nourished as a food digests, the plasma holds all six tastes within it. Your ability to taste is directly affected by the quality of the plasma in your body. In order to have healthy, nourishing plasma to feed your other body tissues, you must try to get a steady supply of all six tastes. This dynamic is part of what allows the taste-holding Triphala to have its unique effect. When you take it nightly—a half-teaspoon in powdered form—you will experience a different taste each time. The idea is that whatever you taste in the Triphala is the taste missing from your plasma and therefore your diet. With this information you can better plan meals and incorporate the appropriate tastes in your diet for your best balance. Note that you will very rarely taste sweet—but if and when you do—it’s time to stop using Triphala. You can use your ability to taste as a tool to balance not only your physical body but also your emotional life. There is no separation between your physical body and your mind. In order to truly see food as medicine and the signals from your body as messages of conscious awareness, you have to take everything, including the signals from the tongue, as valid sources of information. While these signals are biological in nature, the psychology of taste should be taken into consideration, too. Since Triphala is essentially clueing you in on a deficiency in your diet, you may exhibit this deficiency in your emotional or mental life as well. For example, a bitter taste may mean that it’s time to draw your mind inward and discipline your life in certain directions. A pungent taste from Triphala may mean that there’s room for more enthusiasm or vigor in your life. In order to make this Ormus I used Triphala powder added to warm harmonically structured water. Then I preformed the John Hudson method by adding Organic Dolomite and swinging the PH. 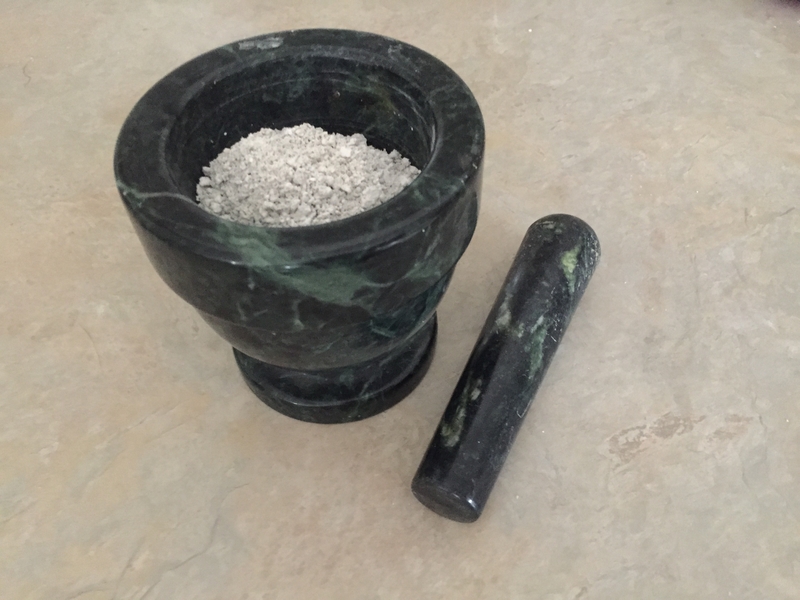 Then after washing it 7 times and drying it out, it is now a fine white Ormus powder.